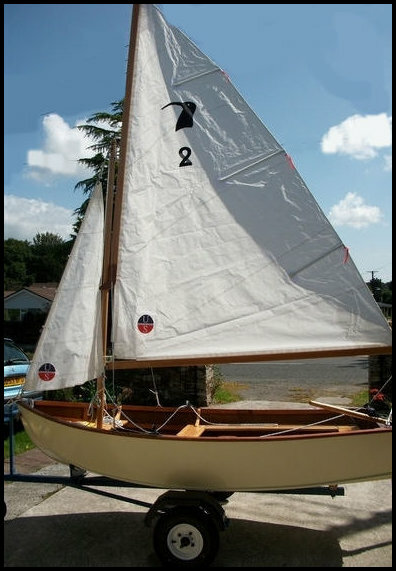 This is a light single-chine V bottom plywood frameless dinghy, built upside-down on formers. Length 9 ft., beam 4 ft., total height 17 in., weight 100 lbs. This is an easily-built cartop dinghy with a stiffened bottom, suitable for rowing or a small outboard motor, and has a good performance under sail. Details for completion as a sailing boat are included in the plans. The sail version features a pivoted centerboard, a gunter rig. and a sail area of 50 sq. ft.
Power UP TO 1-1/2 H.P.